The Springs at Valencia is an active lifestyle community that is located in Edmond, Oklahoma. The Springs at Valencia offers seven single-family distinct floor plans to choose from, ranging from 1,697 to 2,093 square feet of living space with three bedrooms, two bathrooms, and an attached two-car garage. Every home is designed for low maintenance living and includes features such as first-floor master suites, open layouts, and hardwood floors. Plans call for the community to have a clubhouse which is sure to be a center of social activity. Here, residents can use the multi-purpose rooms for community gatherings or private events. There is also an exercise room so homeowners can keep up with a workout routine without leaving the community. Outdoors there is a pool and patio, perfect for enjoying warm summer days. The Springs at Valencia is conveniently located in Edmond, Oklahoma, just outside of Oklahoma City. Daily shopping is easy with a Walmart Supercenter, a Kohls, and other retail stores just over three miles away. For more shopping options, the Quail Springs Mall is just over seven miles to the south. Lake Hefner is just over 12 miles away and is a popular destination in the region for fishing and boating. It is ringed by miles of trails and has numerous picnic sites. When long-distance travel is required, Will Rogers World Airport is just about 20 miles away. The Springs of Valencia's combination of modern homes, great amenities, and a terrific location make it a great choice for homebuyers looking for a low-maintenance community near Oklahoma City. Check back soon for more information on the lifestyle in The Springs at Valencia. 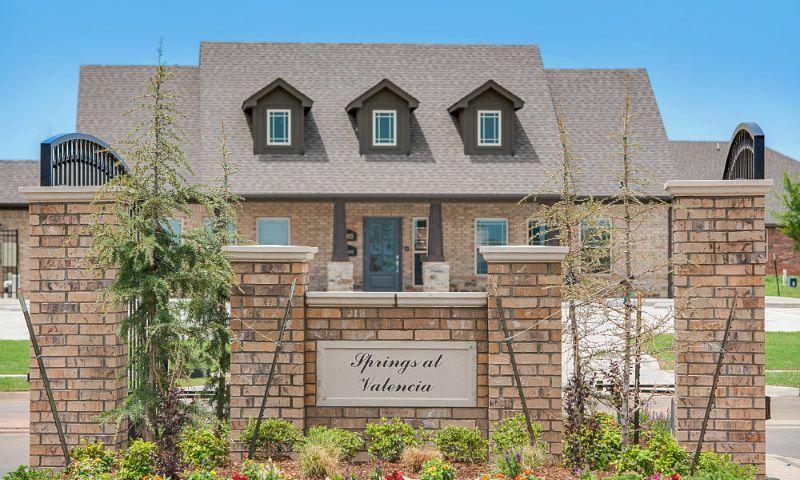 The Springs at Valencia offers seven single-family distinct floor plans to choose from, ranging from 1,697 to 2,093 square feet of living space with three bedrooms, two full bathrooms, and an attached two-car garage. Every home is designed for low maintenance living and includes features such as first-floor master suites, open layouts, and hardwood floors. 55places.com is not affiliated with the developer(s) or homeowners association of The Springs at Valencia. The information you submit is distributed to a 55places.com Partner Agent, who is a licensed real estate agent. The information regarding The Springs at Valencia has not been verified or approved by the developer or homeowners association. Please verify all information prior to purchasing. 55places.com is not responsible for any errors regarding the information displayed on this website.